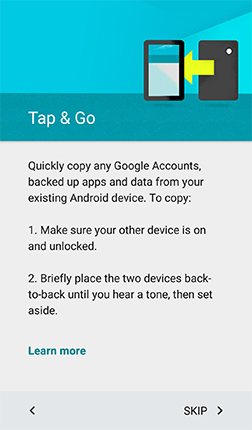 Use the Tap & Go feature to effortlessly transfer your Google™ Account, backed up applications, and data from your old Android™ device to a new Android device. 1. 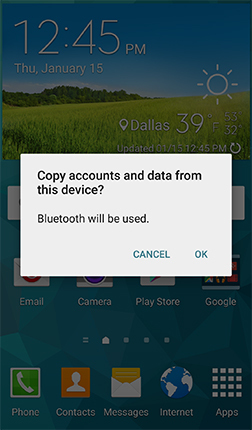 Make sure the NFC feature on your old device is turned on and is unlocked. 2. 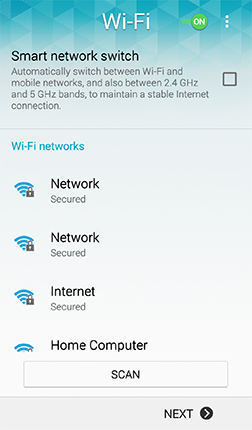 Power on your new device and follow the setup prompts until you reach the Wi-Fi® screen. If necessary, touch the slider to turn Wi-Fi on . Connect to the desired Wi-Fi network. Important: The Wi-Fi feature on your new device must be turned on and connected to use the Tap & Go feature. 3. Continue to follow the setup prompts until you reach the Tap & Go screen shown below. 4. Briefly place the two devices back to back. Separate the devices when you hear a tone or feel a vibration. 6. The process may take a few minutes while your new device copies backed up accounts and information from your old device. 7. 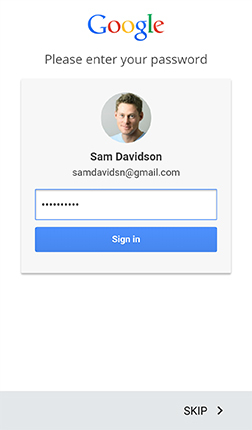 When prompted, enter your Google password on your new device. 8. 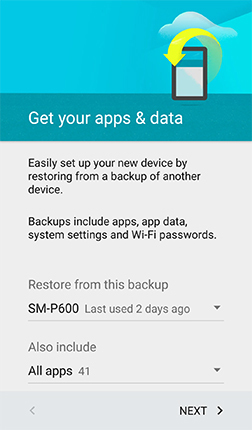 Choose the backup device and applications you want to restore and touch NEXT. 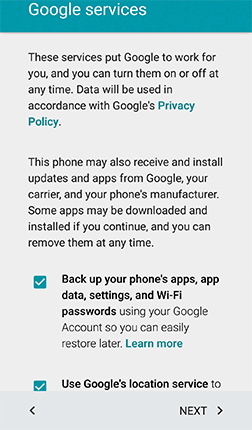 9. Review the Google services' terms and privacy policies and touch NEXT. 10. Complete the setup process. The process may take a few minutes while your new device restores accounts and downloads previously installed applications.